One Lucky Day: Wreath Card and a Winner! Thanks everyone for participating in the "What's your favorite Christmas song" giveaway. I have a few Christmas songs that are favorites. Silver Bells never fails to remind me of my mother since it was her favorite. But if she was still alive, I am sure she would enjoy any Christmas song sung by Michael Bublé because I sure do. But my go to Christmas favorite, which I know I have mentioned here before is, "Breath of Heaven" (Mary's song) by Amy Grant. Just such a wonderful message. Love your tag and its sooooo easy! My favorite Christmas song is White Christmas. Happy Holidays! I have one more prize package to giveaway - you will find today's question at the end of this post. The winner will be drawn on Sunday Morning so check back to see if it's you! Today tutorial is a super easy card using the Christmas Blueprint 2 stamp set. Start by stamping the image of choice onto Ranger watercolor paper with waterproof Black Archival ink. Color the leaves with two colors of marker Shabby Shutters and Forest Moss, then blend with a detail water brush. 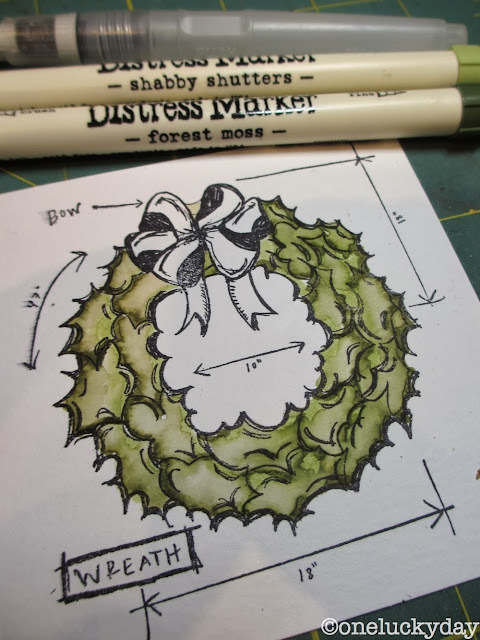 Color the bow with Festive Berries and Walnut Stain, then blend with the water brush. Use Pumice Stone/water brush for the drop shadow and arrow details. Ink the edges of the water color paper with Brushed Corduroy Distress Ink for a subtle aged color. Use a Tonic Edge Distresser tool to rough up the edges. The Ranger water color paper is very thick so it makes for a great torn or distress edge. Add as many layers as you wish to make the card front. I stitched the water color paper to the red Merriment paper, then glued it to the green cardstock. That way the stitching is hidden between the layers of paper. Make a small slice with a X-acto knife in the fold of the green cardstock, so the green ribbon can wrap around the card front. I used a combination of Forest Moss and Peeled Paint Distress Stain to color the Crinkle Ribbon. Add a little bit of bling to the wreath to give it some extra shine. Super easy card that you still have time to make! Do you have a favorite Holiday food? I love your card Paula. The added bling is so cute, great idea. I love this stamp and am tempted to go whip one up. My favourite holiday food...stuffing balls I make every year. Have a wonderful Christmas. Gorgeous card - thanks for the tutorial! My brother comes in from the west coast for a few weeks every Christmas and brings with him a huge shipment of pacific seafood, so I'd have to say my favorite holiday food has become crabs, salmon, and halibut. Thanks for the giveaway! Love the card! Right now I need those quick and easy - yet beautiful - ideas! Favorite food is a tough one to narrow down. I love all of the special cookies we make only at Christmas. But I'd have to say that our Christmas day lasagna is my favorite, mostly because the kids have taken part in preparing it in some way ever since they were tiny. Now they practically make it all by themselves! I've got pictures of the process from every year, and it makes for great memories. What a beautiful card! I've been looking for some quick and easy last minute card ideas, and this one is perfect. My favorite holiday food is a cornbread stuffing casserole that I make every year. I also love cinnamon rolls for Christmas breakfast. This card is beautiful! Love how you showed the coloring step by step! My fave holiday food would have to be sucre a la creme! Thanks for sharing the how-tos of your festive card! My favorite thing this time of year I guess what you'd call fresh cranberry relish. Take a bag of cranberries and mince them up in the food processor, then add about a half cup or so of chopped pecans, and at least 2 big oranges cut up in pieces. (I cut off all the peeling stuff and put the orange segments in the cranberry-pecan mixture--a little time consuming but worth it!) Then add abt half cup of sugar (or more if too tart). Refrigerate this awhile--yum! Paula my favorite accessory and I think one of your signiatures for most all your work are the rayon ribbon bows and the touch of sewing you add to your pieces. They are my favs. I do have a favorite holiday "food" and I'm not going to make it because I'll gain more weight if I do...it's a chocolate peanut drop candy that is sweet and salty and SOOOO addicting and way too easy to make..mix one package chocolate chips, one package butterscotch chips, melt over double boiler, add a can of spanish peanuts and drop onto wax paper! Gorgeous card! Thank you so much for sharing it with us! Anything with dried fruit in it...stollen, panettone, mincemeat bars, and FRUITCAKE!!!! Yep, I love it!!! one of our fave holiday foods is a yummy recipe I have for frosted eggnog cookies. oh my gosh, they are pure delight! Love the bling added to your card Paula. A girls gotta have bling! One of my favorite foods is the rum rolls. I always say I'm going to roll away from the table from eating too many. Happy Holidays! Thanks Paula for another wonderful card love love love ,your blog! My favorite holiday treat is our tradition of apricot balls. one year we did not get any because the dog found them first on the counter at ate them all, a whole lrg cookie sheet full, needless to say we found them in the yard later that day! Fruitcake !! I love the moist spiciness of it . Lovely card! Those blueprint stamps are such fun. My father and brother used to bird hunt quite a bit, and we'd have fried quail for Christmas. Miss those tasty little things! The quail served in restaurants is just not the same. Super card my favourite Christmas food are mince pies which I usually bake but my daughter in law is doing it for me this year, bless her. Dressing (or stuffing if you live up north)! Gingerbread!!! Then candy of the homemade sort. Love the card! A favorite holiday treat is homemade fudge with lots of walnuts. Always inspiring! Favorite Holiday food is my mom's cucumber salad. cucumbers, sour cream, some grated onion and dill. so refreshing! Wouldn't be new years eve without it. It's not Christmas for me until we have hot apple cider from my mom's avacado green crock pot with the broken glass lid that fits the ladle just perfectly. Pizzelle cookies are my favorite holiday food, it is an old Italian family recipe that I only make at Christmas. One of my favorite things about the holidays is making them with my daughters and soon my grandson will be old enough to join us. Love your card. The shading really makes the image pop! I love my father-in-laws cinnamon rolls. I love waking up Christmas morning and smelling them. We all sit together around the table and read the Christmas story while we eat homemade cinnamon rolls. So, because of what goes along with them, cinnamon rolls are my favorite holiday food! what i beautiful card. You always inspire me! my favourite christmas food is Turkey ... love turkey!!! As always Paula I am so inspired by your work, simple or intricate, your projects are always the ones I want to copy. My favorite food at Christmas is, of course, all of them, not really. Actually my husband's contribution to the holiday goodies is his Chex party mix to which he adds popcorn, cheese crackers, honey nut cheerios and the rest of the good stuff. He usually makes four or five triple batches and we eat it every night. My youngest son is on a mission for my church in South Africa and the one thing he wanted me to send was Dad's chex mix, the most expensive chex mix to date, $111.00 for shipping, but so worth it if he gets it. Sorry to be so long winded. Great job with the wreath. My favorite holiday food is cut out cookies! What is Christmas without these cookies? I think they are Santa's favorite too! Thank you for the tutorial... Always appreciate the details. My favorite Christmas food is smoked turkey. Then turkey and rice soup made with the leftovers thrill me just as much. Must say that anything shared with those I love is a blessing... Merry Christmas! Love the card-especially the stitched edge detail around the wreath. Your instructions make everything so easy to do! My favorite holiday food would have to be Sees Candies Cinnamon lollypops. I hold out for "Santa" to place my order and have them arrive in time for a place under the tree. Thanks for the chance to win! Tracy P.
Favorite holiday food HAS to be cut out cookies! I make them every year and give them to "some" special family members. I turn on the Christmas tune role, bake, decorate and sing away!!! Gorgeous card as always! I love Breathe of Heaven as well. One of my favorite Christmas foods is Maraschino Cherry-chocolate Shortbread cookies. So pretty and tasty. Love the way you used the water color pen! Favorite holiday food..maple walnut fudge!!!! What a wonderful card, Paula. I love layering and with added stitching, it makes it that much more homey! My favorite holiday food has to be the COOKIES COOKIES COOKIES! I love all the cut out cookies with their fun colored sugar sprinkles and festive frosting decorations! YUM! This card is just too cute! As for food - my kids can't have a holiday without chocolate no-bake cookies! Lovely card. My favorite holiday food is/are spritz cookies, especially green trees! I gotta have my mashed potatoes and gravy! mmmmmmmmm! I'm never too sure about how to use the blueprint stamps but I love your card with the little extras like the stitching and word band on the stained ribbon. And thx for the great tip to make a small slit in the fold for the ribbon. Favourite Christmas food - all the treats with dried fruit like Christmas pudding and fruitcake. What a great looking card! Thx for the op to be in the drawing...My favorite Holiday food...Pfeffernüsse cookies! Growing up in Quebec,Canada; Tortiere pie continues to be my holiday favorite. The combination of the rich pastry and warm ground meat is a simple taste sensation. The TREAT=Staying up way past bedtime to feast with relatives LATE on Christmas Eve; seeing the frost form on the windows and being cozy inside. LOVE the wreath and your special touch of the dimensions...keeping it Real...brilliant! I love the card. I don't have a blueprint stamp in my collection yet, but I think I might look for the wreath stamp! My grandmother used to make Lefsa, a Norwegian treat that is generally considered a Christmas dessert. It's basically a crepe made from potatoes, then you butter one side, sprinkle sugar, and fold it several times. It's heavenly stuff! Love the card! Favorite Holiday food: Snickerdoodles hands down. Thank you! Loved the card! Want the stamp. My favorite holiday foods- the appetizers. Cheeses, pepperoni, clam dip, chips, pigs n blanket, & dumplings. Love your wreath card! My favorite holiday food.....Hard to pick just one! I guess pie and frosted sugar cookies are at the top of my list! Happy Holidays! Your creations you share are always so wonderful. Love all of the detail that you add. My favorite Christmas food is strawberry pretzel salad (don't be fooled--there is nothing 'salad' about it!). Your card is fabulous!!! My favorite holiday food - that's a hard one! It has to be homemade fudge and homemade Almond Roca. Happy Holidays!!! My favorite food this time of year.......... Gingerbread cookies with a latte. Love your card! I always forget the shading like you did around the words and arrows. My fav Christmas food is my sisters fudge!! I wait all year for that stuff!!!! Absolutely love your card. My favorite holiday food are ice box cookies. My aunt that lived next door and gave me my love of crafting taught me how to make these cookies. Have a Merry Christmas and thanks for the goodies. The favorite at my house is oxtail soup. It's a recipe passed down through the generations, and Christmas eve wouldn't be complete without it. I loved Rachel's comment about her mother's avacado crockpot. I also have one the we make spiced cider in - another Christmas tradition. Tim Holtz fat quarters...my heart skipped a beat...! I love your card - thank you for the tutorial. It's hard to choose a favorite holiday food - I love so many! Some of my favorites are all those cream-cheesy dips with crackers, turkey and stuffing, homemade rolls, cookies of any kind. Great card! I make homemade cinnamon rolls on Christmas...decadent and delicious, and the house smells wonderful. its not common but we have Corn Chowder ever Christmas Eve, YUMMMM!!! Festive Christmas eating! That stamp i LOVE!!!!! Love the card, and yes, this is simple...sometimes simple is the most beautiful! My favorite holiday food is cranberry/orange/apple relish that I make. I could eat bowls full of it. Also, peanut butter fudge...but not together with the relish. My favorite food is the turkey rice and cheese casserole my sister makes every year. Your card is lovely and you did a wonderful job coloring it. Thanks for the opportunity! What a festive card, Paula. Love how you always show us step by step how you create. I have to say that my all time favorite food for the holidays is Dresdner Stollen, that my girlfriend sends me every year. Thank you for the chance to win. Great card! Looks so festive and yes easy to put together quickly. I have fond memories of my Mom making cheese fondue on Christmas Eve. We had so much fun dipping the chunks of sour dough bread and olives into the yummy cheese. fun card - favorite holiday food? our christmas brunch - strata, little sausages, holiday pull apart rolls, fresh fruit salad, homemade chex mix and christmas cookies - best meal of the year! Thanks for reminding me about the importance of the drop shadow-it adds so much depth! My favorite holiday food is homemade Chex Mix! My favorite holiday food is Peanut Butter Blossoms cookies! Oh the holiday foods I love. It used to be the family tradition of baked ham and potatoes au gratin, but now we always have a huge prime rib. But the food that's the standby is "Grandmother's Beans" a pickled navy bean salad....wonderful. My Mother used to give people the recipe, but leave out a ingredient. Very funny... only the worthy, in her eyes, would get the right recipe. Happy Holidays everyone. Thanks for sharing the lovely Christmas card. My favourite holiday food is mince pies i love them and my grannys favourite Christmas pudding warm memories flood back. My favorite holiday food is frosted sugar cookies. I decorate about 40 dozen for my Mom every year. Only problem is I am allergic to wheat now and can't eat them anymore! All of your work is lovely. I enjoy each and every post. Every Christmas eve we go to my mom house and she prepare us fantastic Christmas dinner…my favourite Christmas food is her, some kind pie with meat and cheese …there is no special name for it, but it taste fantastic even next day. I wish you happy festive season! I love the card. I have all the "ingredients" to make it and yet, yours looks so great! My favorite food would be stuffing. No one in my family will eat it because they are not eating gluten so I need to have company to justify making it. Did I say that I love it? Love this card! My sweet tooth gets indulged a bit this time of year! My mom makes the best toffee at Christmas time. So yummy. Ham....definitely wait for it all year. Thanks for the steps to make your amazing card....love the "Blueprint" stamps! My favorite food would have to be the turkey and stuffing sandwich the day after Christmas dinner.....fresh white bread and a little Smart Balance or mayonnaise. Merry Christmas and Happy New Year....thanks for all the tutorials all year long! Love the card! Love the blueprint stamps! Love Tim Holtz!!! My fav holiday food is Cranberry Salad. It is sooo yummy! It has cranberries, wild cherry jello, pineapple, pecans, and in the middle is a white layer with cream cheese mixed with something. I can't remember what it is, but it is deliscious! Now I'm drooling! This wreath card is simply sweet!!! My favorite Holiday Food is this wonderful Breakfast Casserole that I make on Christmas morning that has hashbrowns cooked in the oven and then topped with scrambled eggs, cheddar cheese, diced ham, and then you can add various toppings such as jalapeno, green onions etc...I've made it for my Hubbie for 18 years and now, he along with my 2 sons, look forward to a hearty brunch on Christmas. Which reminds me, I need to go to the store! Merry Christmas, Everyone!!! Cool colourful & cheerful card! Rich, fruity Christmas cake is my favourite! Beautiful card, Paula! It wouldn't be Christmas without my Nana Sara's Sour Cream Coffee Cake. Makes me drool just thinking about it! my dear son, many, years ago, was asked, "what do you want for Christmas?" his reply was, "I want Santa to bring raisin bread, for our Christmas breakfast. "..i never see raisin bread that i don't think of his 4 year old sweet innocent face.. 47 years later, we still have raisin bread, and remember having our dear children with us.. love this technique, the drop shadow is perfect..thanks for sharing your art! Love your gorgeous card! My favorite is cut out cookies. I only seem to make them at Christmas, and it's all my kids want. Wow! Thanks so much Paula. I can't wait to start creating with all of the cool Tim products. I love early Christmas presents. Wishing you and your family a Merry Christmas! Love the card too--the colors are gorgeous! I love hot cocoa under the tree. With whipped cream on top! Thanks for sharing the card. It is gorgeous. Thank you for the tutorial. The card is beautiful. My favorite holiday food is pumpkin pie. Such a gorgeous card and thank you for the wonderful tutorial!! My favorite holiday food is Sweet Potatoes!!! YUM!!!! What a beautiful card Paula. Love that wreath and the coloring. The metal greeting looks amazing... also like the red stitching! I love having seafood at Christmas Eve... and lots of chocolate! Thanks for the chance to win. My favorite is old-fashioned sugar cookies, covered with sprinkles, frosted, dipped and dunked. (The kid and the raisin bread is a dead-ringer winner.) Merry Christmas Paula, God bless. Always love adding ribbon to my cards and being able to personalize the color is the best part. Every year on Christmas Eve my sister makes the best Baklava, so yummy. My favorite holiday food is my grandmother's Applesauce Cake. She's not been with us for many years, but we still carry of the tradition of only making this special cake for Thanksgiving and Christmas...it makes it all the more special!! Be especially blessed. Favorite holiday food would be anything I could share with someone else! Fudge, fudge and more fudge. My favorite Holiday food is lefse and rice pudding. Yum :) Also thank you for this awesome tutorial. It's beautiful! Home made fruit mince pies are my best...I now make the ones my granny used to make, keeping family traditions alive. Oh, Paula, I have a long list of favorite holiday foods, beginning with my sister's Peanut Butter Balls, then Hermits, then my grandmother's Sugar Cookies, then ... oh, they're all cookies or candy! 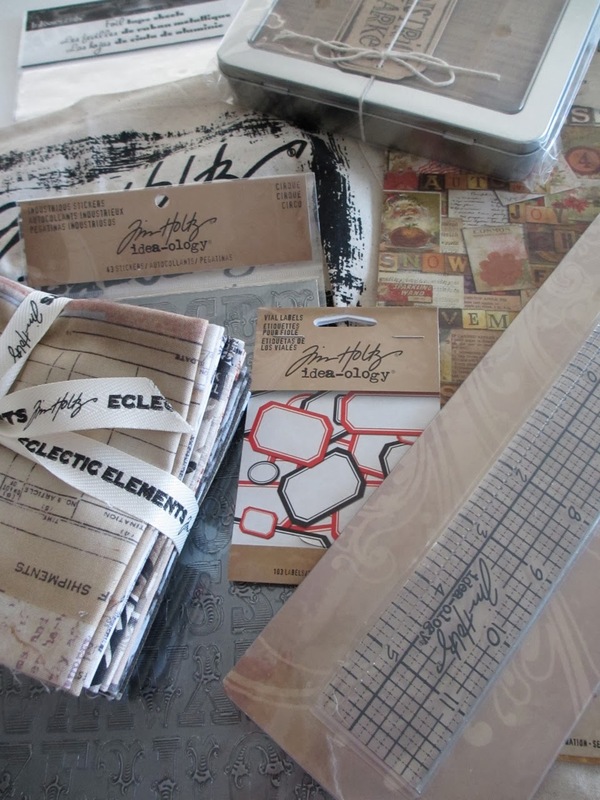 I love the Tim Holtz fabrics - thanks for providing them as a prize. And Merry Christmas! Oh Paula I would ask you what is your favorite Holiday food? My favorite is Buck-eyes. My favorite at Christmas is a rich dark fruitcake - British style. Growing up, our family had a tradition of having strawberry topped waffles with sausage. Now we have that for dinner on Christmas Eve. My favorite Christmas foods are frosted sugar cookies - love them!! We always have cinnamon rolls in the shape of a christmas tree on Christmas morning. My favorite Christmas "food" is spritz cookies. I loved making them when I was a kid, using my mom's old cookie press. My mom is gone now, but I still have her cookie press and re-live happy memories of her each time I use it. Those cookies taste so good with hot chocolate or a cup of tea! Your projects are always so inspirational. Thank you for sharing all your ideas and talents. My favorite Christmas food is the homemade stuffing that my late father in law used to make! He shared his recipe with me last year, but mine simply won't compare. My favorite Christmas treat is Date Nut Bread. My grandmas recipe. I only make it this time of year. Soo good! My favorite Christmas food is Tamales. A lot of work in making them but worth it. Love the card. Thank you for sharing. I just love all the holiday foods we have from the honey baked ham to new years fondue! I guess if I have to pick a favorite it would be the corn pudding I make from fresh corn and my mom's stuffing! The holiday dish I look forward to is pasteles, a traditional Spanish meal. OMG! I buy about three dozen twice a year from a Puerto Rican friend who makes some of the best I have ever tasted. It is a wrapped dish that is boiled in special paper tied with twine. When placed a a dish ready to eat, it's like unwrapping a fine Christmas present that you know took a great deal of time to prepare and made with love. Thank you Paula for sharing a great holiday card . Have a very wonderful Christmas with your family and friends! Love this, especially the red thread. beautiful card, thank you. my fav holiday food is the turkey and cornbread dressing.